Owing to our in-depth domain expertise, we are providing a qualitative range of Fire Escape Respirator. Manufactured as per industry standards using quality tested components under the vigilance of our vendors’ professionals, this respirator is in compliance with industry norms. Our offered respirator is available in diversified designs and specifications to cater the demands of our valuable clients. 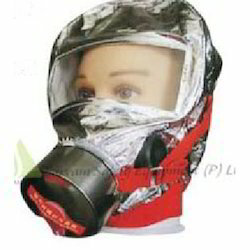 We offer this respirator to our clients after checking it against different parameters. Looking for Fire Escape Respirator ?